Asner’s Roosevelt is a charming, demanding, uncompromising man of exceptional skill in dealing with people from every walk of life, and the actor imbues him with the kind of gruff bullishness and vitality we’ve seen in him from other roles. Of course it’s not a big surprise to us, since he’s played in our production of FDR in more than 100 cities since 2009—and he’s a prime example of why we love producing plays! It is a great way to sail into the holidays, with hopeful prospects of an amazing 2015 season (we start in Chicago on April 10, 2015)! Dear Friends, Thanks for sharing recent Ed Asner review. Delighted to read it and of course not surprised!!. Wonderful actor and everything he does is a privilege to observe. We with Theatre at Sea were fortunate to see Roosevelt with Ed Asner at its start and remember it performed with great admiration and love!! I did post a comment. 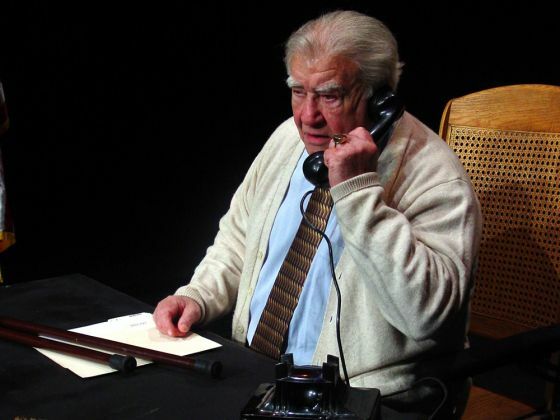 Any possibility of seeing Ed Asner’s Roosevelt in New York in 2015? Love being in touch. Thank you.